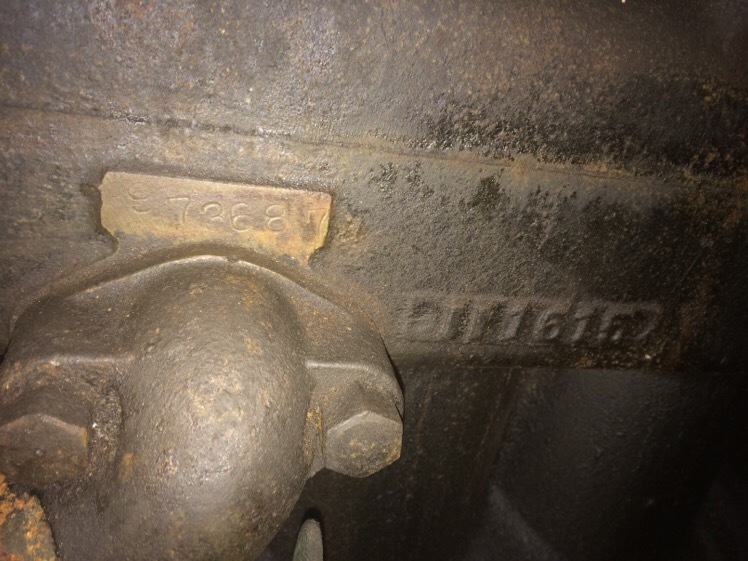 Model T Ford Forum: Help with serial number identification! PLEASE! Help with serial number identification! PLEASE! Model T Ford Forum: Forum 2018: Help with serial number identification! PLEASE! I have a 1915 Model T touring that I am attempting to bring back from the brink of oblivion. Supposedly, the engine and trans. are original to the car. It looks as horribly rusted as the rest of the vehicle, so maybe it is true! The engine block has a casting date of 8 10 15 but, the serial number is 961205, which puts it's assembly some time in November. Is that an unusual amount of time to have lapsed between casting and assembly? Perhaps, this is a clue to something. Any help would be greatly appreciated, as Iam trying to restore this car true, not only to it's model year but,also to the month it was assembled. My car was 6000 assemblies after yours. I will check my block for cast date. It is not typical, but not unusual. Whether it is August 1915, or November 1915, it would be a 1916 model. Black rims on the lights, etc. Hm;m, mine is 38,7xx from yours, I'll look at it. Keith is right. Both dates are in the 1916 model year. A couple of other things to check. 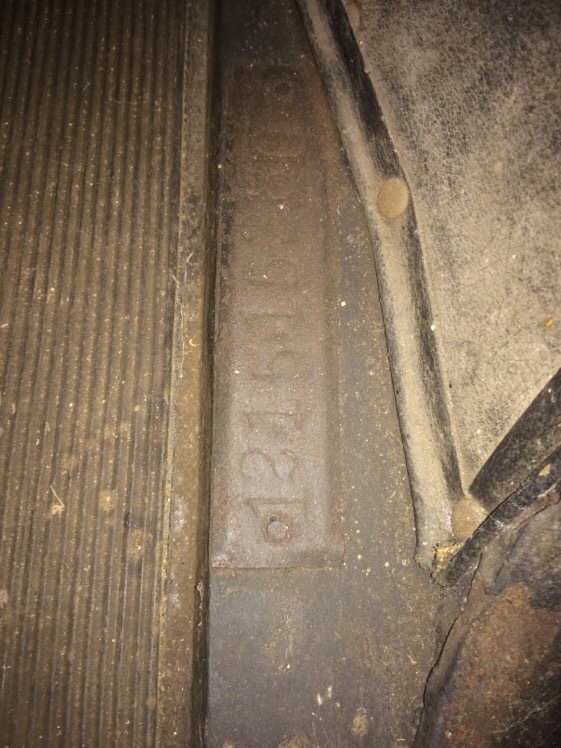 Typical 1915 pedals are ribbed, and 1916 are smooth (unless the car is Canadian). Will a magnet stick to the hood? 1915 is aluminum, 1916 is steel. As Keith says, 1916 headlight rims are black, and so are the side lamp and taillight caps. Lots of parts have been changed in a hundred years, so none of these items is definitive by itself. But taken as a group they're pretty good clues. The example in the Model T encyclopedia on the MTFCA site shows engine #906044 with a 9/14/15 casting date and a 9/23/15 assembly date. The hood is aluminum and BADLY worn and battered. The decorative rims on the side lights and rear light are brass. One of the headlight rims is brass and the other appears to be chrome. Radiator is brass. Pedals are bare, smooth steel, with no markings. Sorry, for the delayed response! (I'm at work) Thanks for the responses! I live about 30 minutes from The Hrnry Ford Museum. I wonder if they might have any records that are available to the public? The Benson Library at the Ford Museum has some records. Thanks,Darel! I will look into that! The time between casting and manufacture dates could be anything from a day to several months. SOMETIMES it can mean the block may have had a defect that was deemed repairable. Blocks went through a series of machining and inspection processes. Truly defective blocks would be melted down and recast in another run. Lesser defects were set aside and used as fill work, repaired by workers between other manufacturing tasks. Cylinders sometimes had to be rebored and special oversize pistons installed (.001, .0025, and .005 were common). Minor water jacket flaws were sometimes welded, and/or careful regrinding required. Special inspectors would judge the amount of work required for repairs and make the determination whether down time was better spent on a repair or other needed tasks. Repaired blocks were then put back into the line, usually winding up in a car. However, a significant time between casting and manufacture does not necessarily mean a defect. Much of the time, especially in the earlier years, production orders were constantly changing. At many times, things like unfinished blocks were set aside by (maybe even the hundreds) while productions were shifted. Often, such set asides were last in first out in a storage room. That also meant that the first ones in may have sat for months before they were returned into the line. Like David D, I also have a December '15 production engine block. I can't get to it easily where it is stashed in front of a car that doesn't run and is short a couple wheels and tires. But if I recall correctly, it is a December 13 '15 manufacture, with a casting date in the first week of December '15. I have another '15 block with only two days between casting and manufacture dates. Most of the changes between the supposedly '15 models and the '16 models were made on a running basis. Factory photos show both iron and aluminum hogsheads in the production lines in December '15. For both hogsheads and hoods, steel started to show up around September 1915, however, aluminum appears to have continued to be installed at least as late as January 1916. Painted and installed? Who would really have noticed the difference? Thanks for sharing your knowledge, Wayne! Are you sure the first number is a 9 and not an 8? If it is 861205 it would have been assembled 8/13/1915. I have an engine with a 9/11/15 casting date that I believe is #898XXX. The reason I say I believe is because the pad is pitted, the numbers are hard to see, so I could be wrong. It came with aluminum hogshead with two ribbed pedals and one smooth pedal. I"m glad Wayne jumped in with the variations. If you look at the pic of engine 1,000,000; it has an aluminum hogshead! That was on Dec 15, 1915 (same DAY as my block was stamped). The ribbed pedals did not last long in production in the US. PS, my block is also difficult to get to to read the casting info, I hope to check it this evening. A little later, but my 1916 engine was cast on June 17, 1916 and the car was assembled on June 20, 1916. Wayne: My hogshead is aluminum. Tom P.: First number is definitely a 9. It's very clear and is an upside down version of the 6 immediately next to it. Also, and again, thank you to ALL commentors! One more thing, if anyone would care to comment on: My steering column does NOT have a tube for the horn wire and what looks to be an original piece of wood, a long the inside top of the false door has two holes that were clearly made by screws and that are oriented in a manner consistent with images of horn bulbs being mounted there. The car does, indeed have a very well "seasoned" brass horn. I believe the 1915 cars had bulb horns. The magneto horn came out with the 1916 model year. During that period of time, if the engine failed for any reason, the Ford Motor Company supplied a new block and a set of numbers to stamp the same number in the new block. That often made the serial number older than the casting number and it happened more in the early days, when that block casting was a totally new concept. The only difference you might notice is the numbers are not in such a neat row. Some place I saw a photo of the cast iron device, with an attached handle, that was used at the factory to hold and the serial numbers and inmprint the whole number with a single hammer blow. Those original numbers were all very uniform spaced and in a very neat row. The horn is another thing that had a long crossover time. Evidence exists that electric horns began showing up on open cars around July or even June of 1915. It used to be believed that the bulb horn was discontinued somewhat earlier. So many Ts had after-market hand klaxon horns that it was believed they were factory issued. It has been effectively proven that the hand klaxon horns were NOT issued by Ford, but were just very popular accessories. While some Ts may have had electric horns earlier, evidence also shows that bulb horns continued to be used well into at least September of '15. Some evidence indicates bulb horns may have been used into calendar 1916. At least a couple surviving January 1916 model Ts apparently had a bulb horn when new. Our 16 touring has a casting date 11 16 15 serial no 973678 do you have a body tag on yours Scott? Well, finally got to my garage, and my Dec 10 stamped motor has a casting date of 12 -5-15, so that block didn't hang around long after it was cast. James: My serial numbers are NOT neatly done! Wayne: Thanks! Knowledge of the history of is as important to me as having the car. I really would like to RESTORE the car to what ever it was, as opposed to making it into my own vision. Paul: I haven't found them yet but, I am still researching possible locations/clues. My T is very badly rusted. (The frame is in GREAT shape, though) Some things are damaged. A few parts are missing. I very much enjoy all of the insight. Considering that the side lights, rear light, and one headlight have brass trim, do you folks feel it would be "correct" to keep the brass for the lights, especially when considering what James had to say about serial numbers and knowing that my T's serial numbers are NOT neatly done? I would appreciate an opinion from every single person who is willing to give one! Your numbers look exactly like mine, that's often how they looked. Brass trim, Hmm, would have to read up on the change dates, stuff did get used pass the change dates, sometimes way past depending on how many parts were in stock when the change was adopted.